Alright, let’s make this quick. 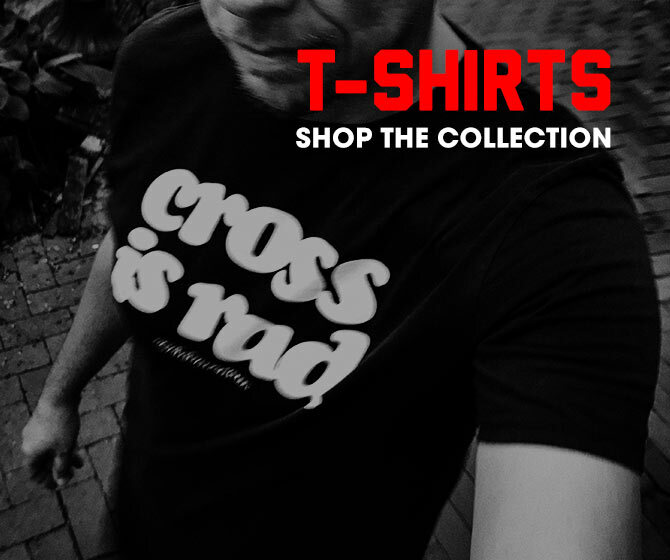 I gotta get these done before the #ompoop really hits the faan. And by quick I mean, an image count that’s wildly out of control. This is another massive post, but luckily there’s break midway through before E3 starts. But, you’ll be so excited that you won’t be able to wait to finish this fantastic post. 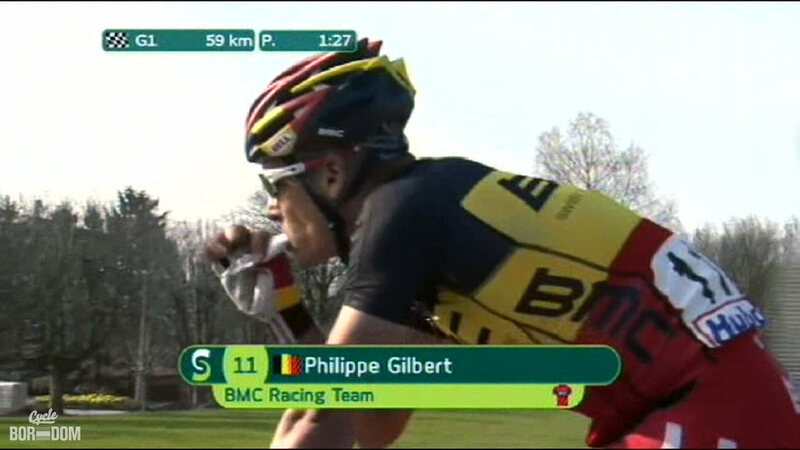 Tasty midweek snack of Belgie racing. Niki and Jelle, riding in a break, p-e-d-a-l-i-n-g.
Point break. Actually, it’s probably more like point gap, but break has the Keanu reference. 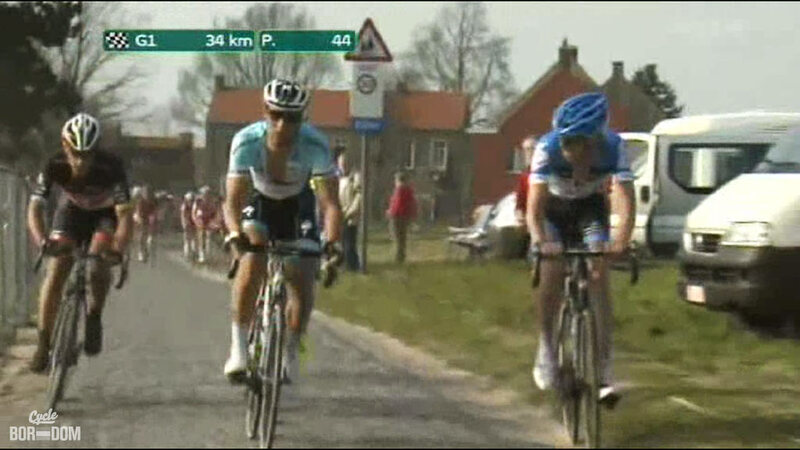 Terpstra begins the crushing, spectator begins the gesticulating. This guy. 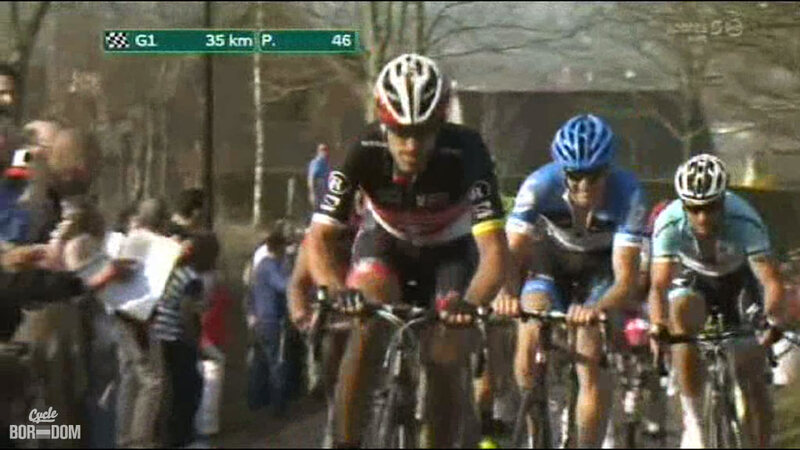 Jered Gruber all out on the Paterberg and ****. Niki has plenty of time to celebrate his solo win—then proceeds to throw commercial gang signs. 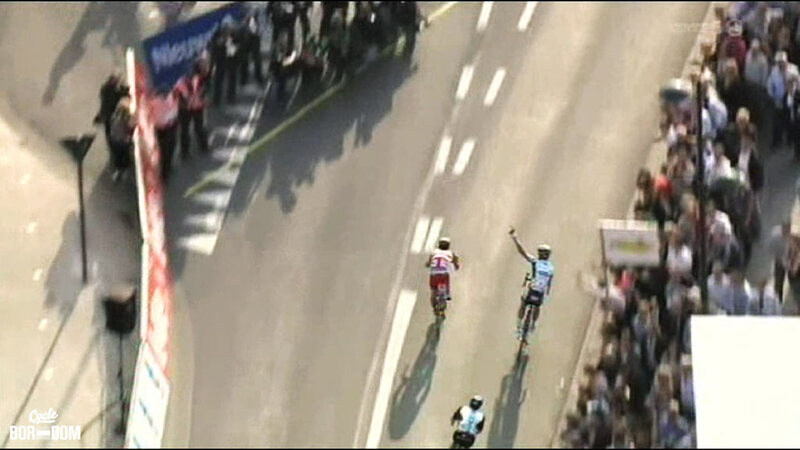 Sylvain Chavanel outsprints then awkwardly celebrates in front of Koen De Kort to round out the podium. 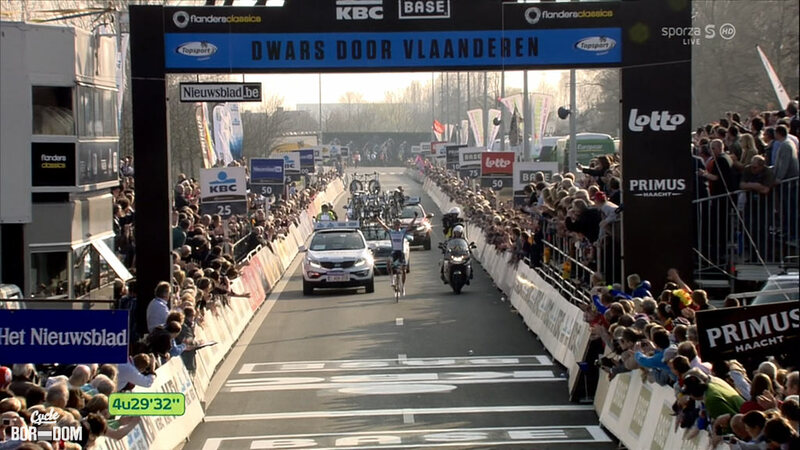 Nice to see Koen on the podium—great effort. Unfortunately, he crashed badly a few days later. Have to admit, E3 was a damn good race. 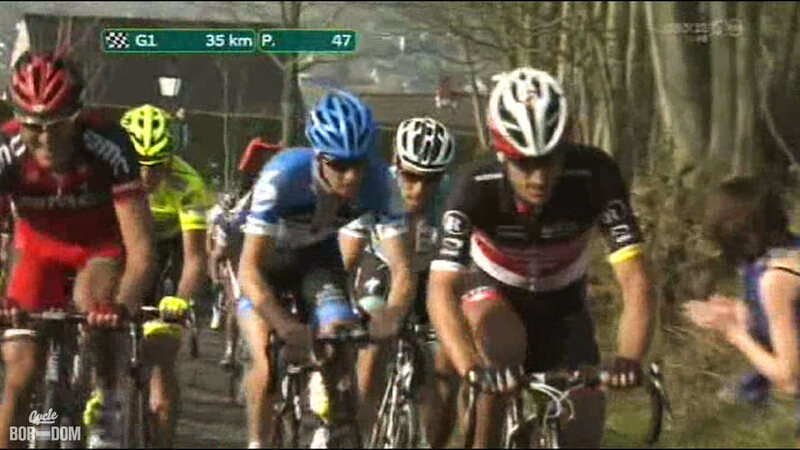 The hellingen were more selective than those of the just-finished Gent-Wevelgem. Enough so, that I feel E3 should be given Classics status and GW relegated. But that’s just my opinion, and who cares. 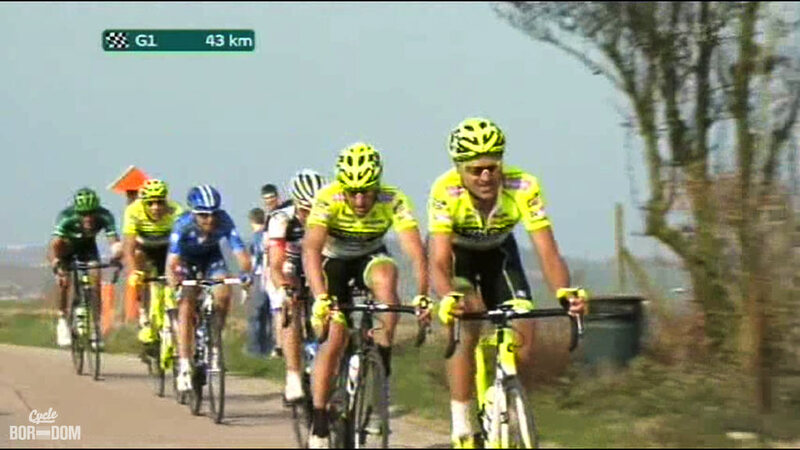 PhilGil’s on the rear of the peloton more than Voeckler these days. 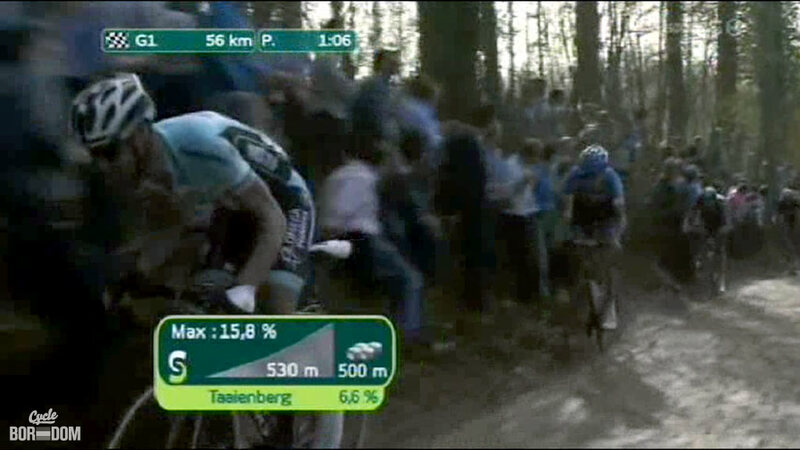 I don’t think I’ve EVER seen anyone attack the Tiaaenberg as fast as Tom Boonen did this time. 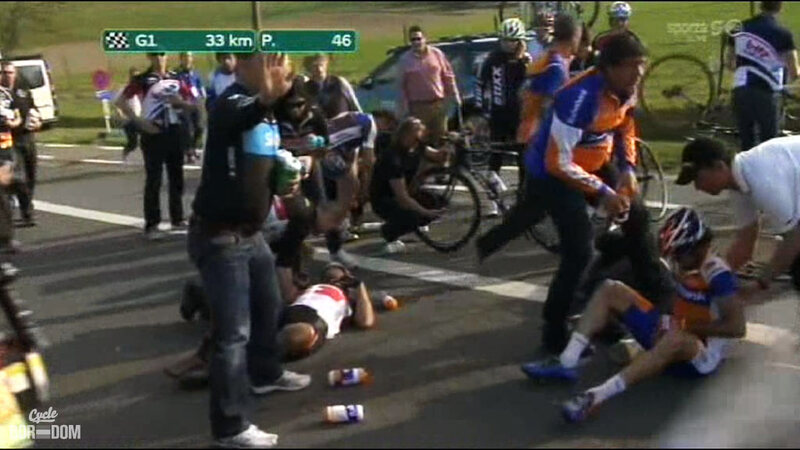 While the attack didn’t destroy the field, it definitely set the precedent for the rest of the race. 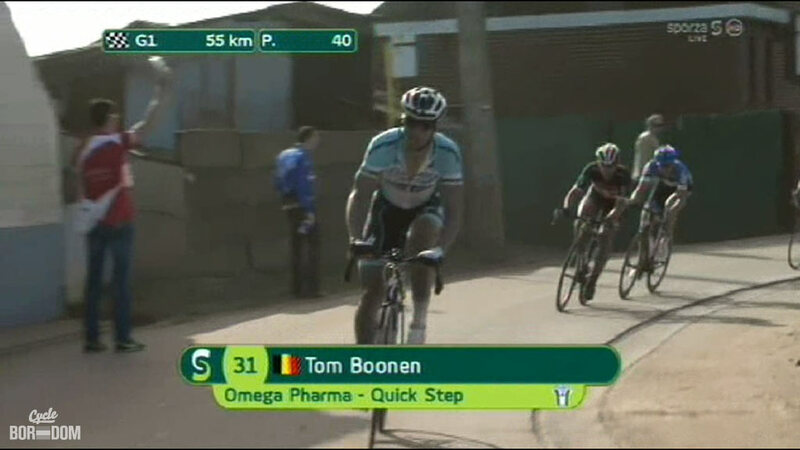 Attack begins—Tommeke’s already at warp speed. 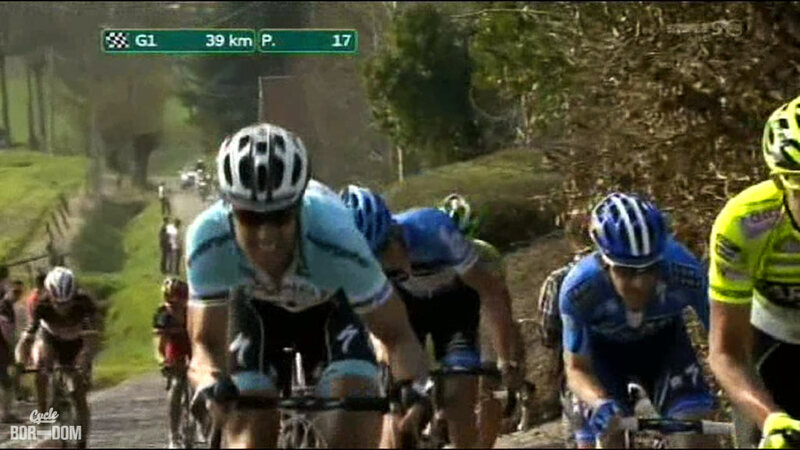 At this point, he’s in full sprinter’s tuck—going uphill. Tommeke pulls up a bit, but is still flying. 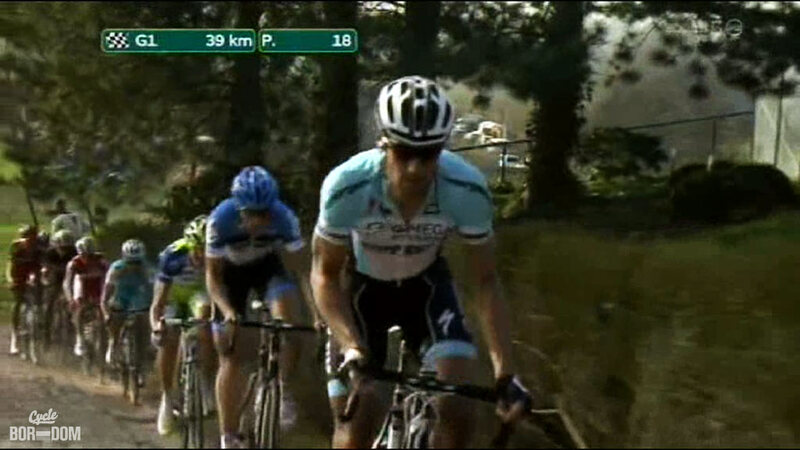 Vanmarcke claws his way back to Boonen’s wheel. Unfortunately, it didn’t get rid of THAT guy. 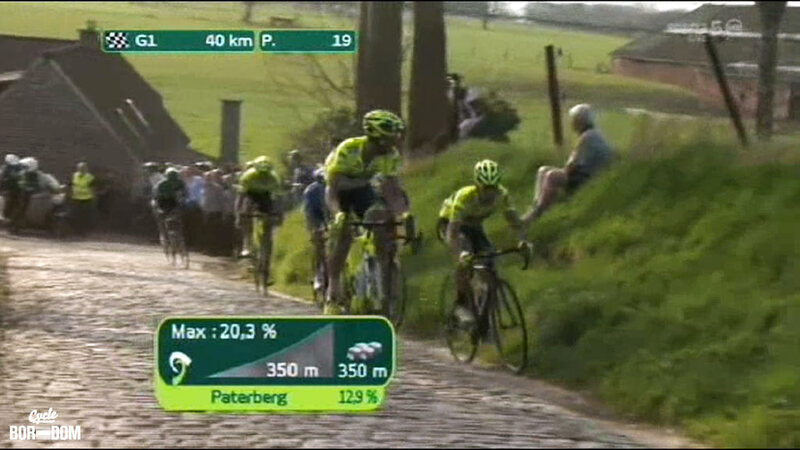 Farnese-Vini crew blasts onto the Paterberg, about to execute Operazione Gattopult. Operazione Gattopult is a go! Gatto is about to be released. Boom goes the kitteh! 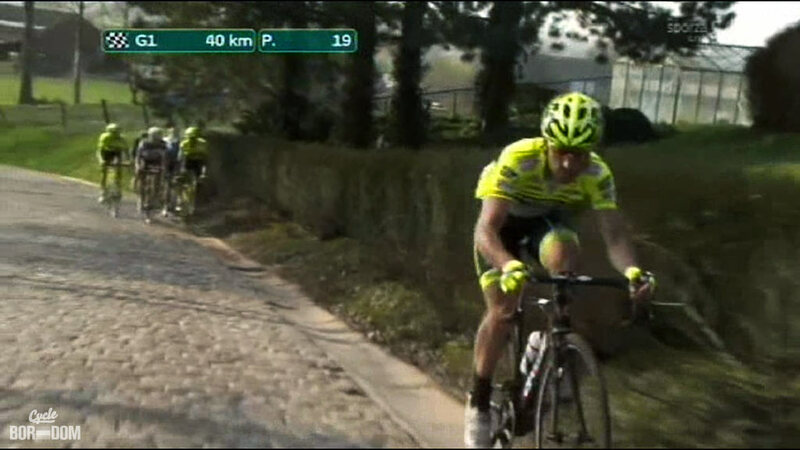 Gatto is released as his teammate cobbleblocks everyone behind. The Gatto reaches escape velocity. Operazione Gattopult is a success. Riiiight there—that’s where it bites. Tommeke catches the remnants of Operazione Gattopult. Fabs is creeping. 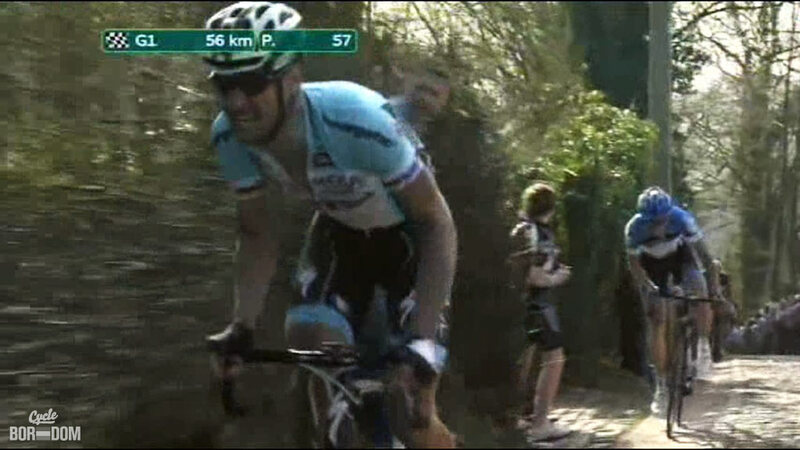 After driving deep up the backside of the Paterberg, Boonen now shows us his baller climbing style. 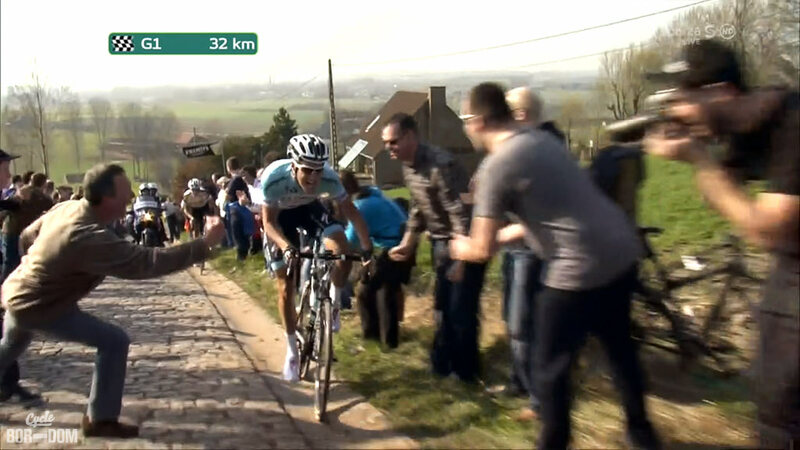 For the most part Fabian hadn’t been a factor in the race. 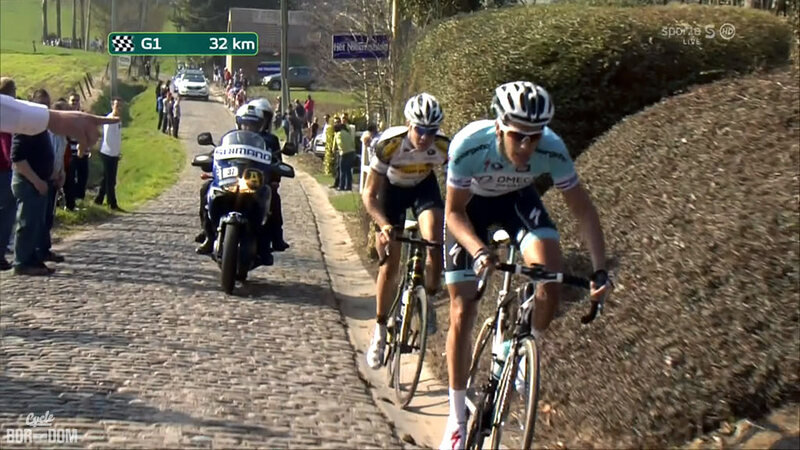 He changed that on the Kwaremont. 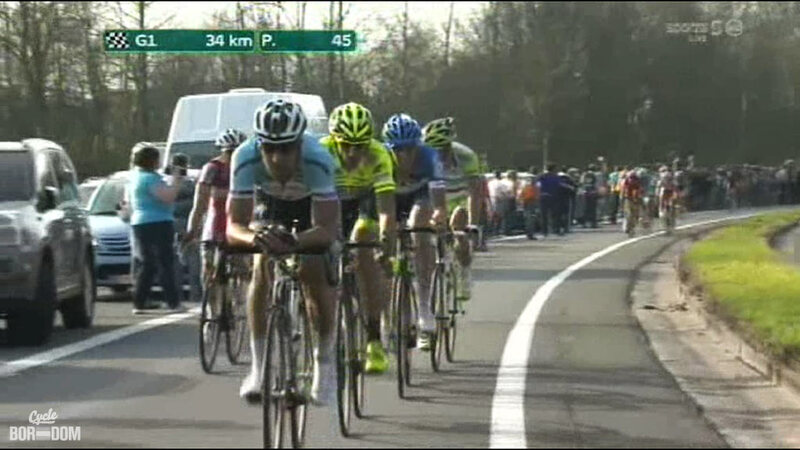 Fabs begins making the attacking with Tommeke in tow. 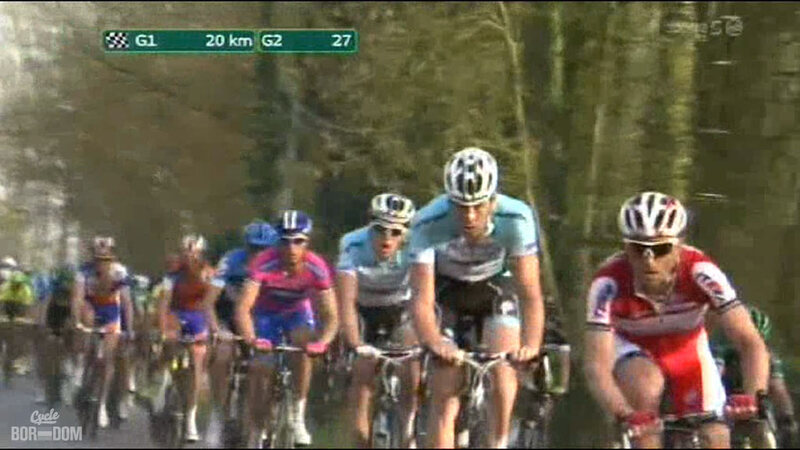 Vanmarcke spots the Dark Lord. 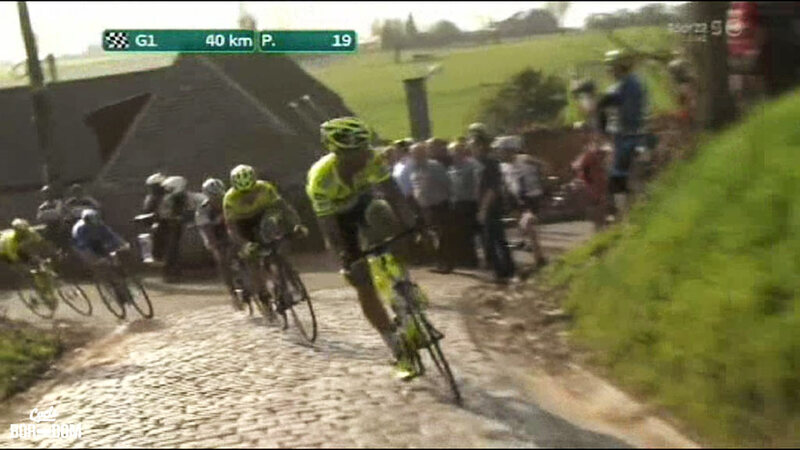 Sep dives across for the Dark Lord’s wheel, but ends up cobbleblocking Tommeke. 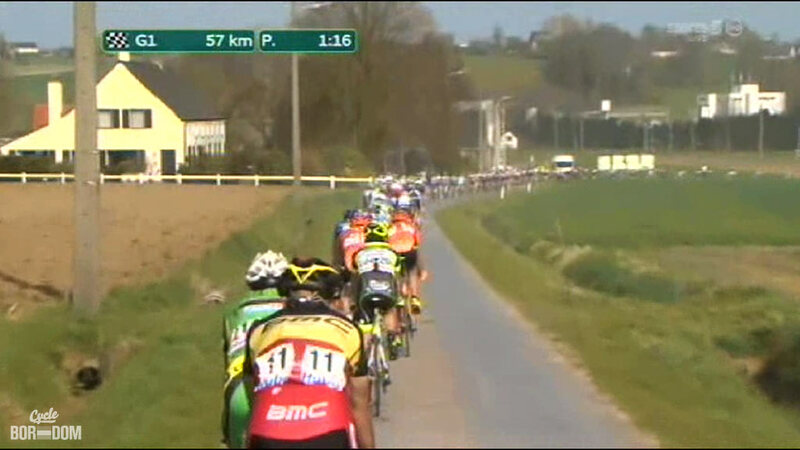 Like geese in migration formation, they line up behind the Dark leader. 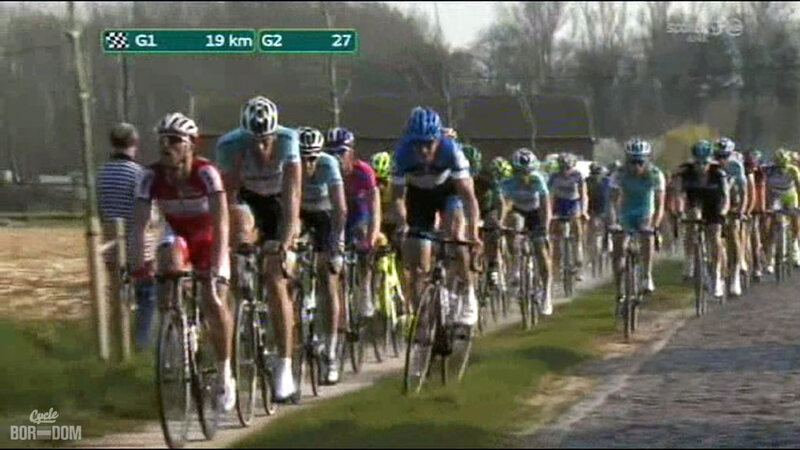 Apparently, this paceline of geese is both strong and selective. Pippo the goose’s wing was broken not long ago—but he’s flying now. The geese are unaware one of their own has been dropped. 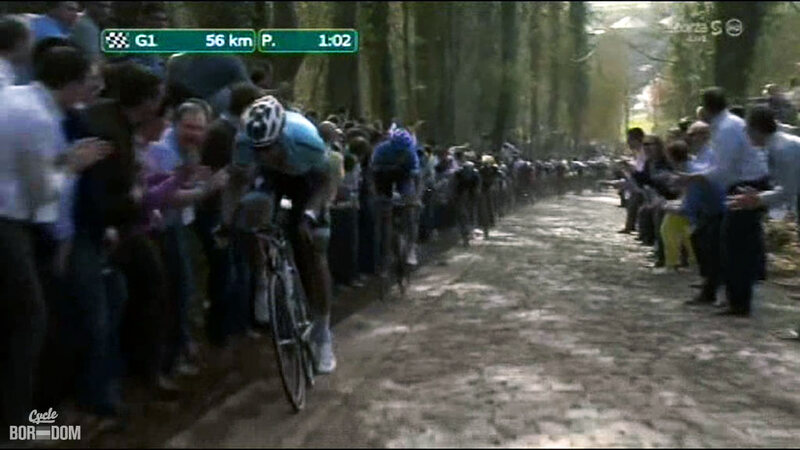 Seconds later, Carlos Barredo launches off the Kwaremont, crashing into the back of Fabs. 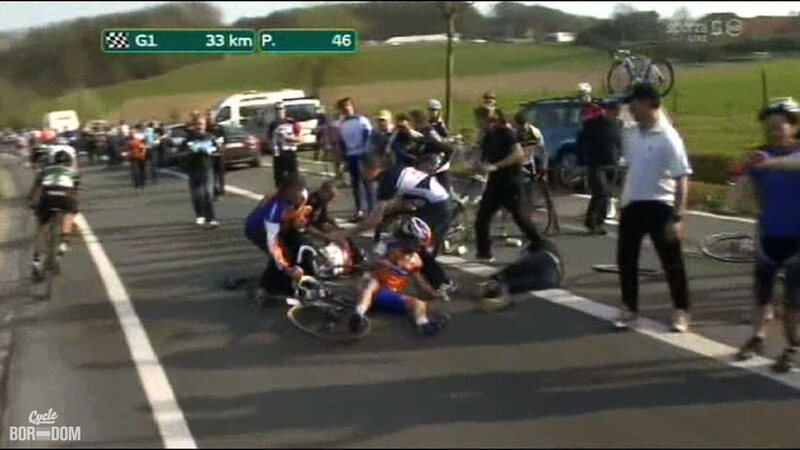 Carlos broke his arm, while the mechanic suffered a broken nose and 25 stitches. 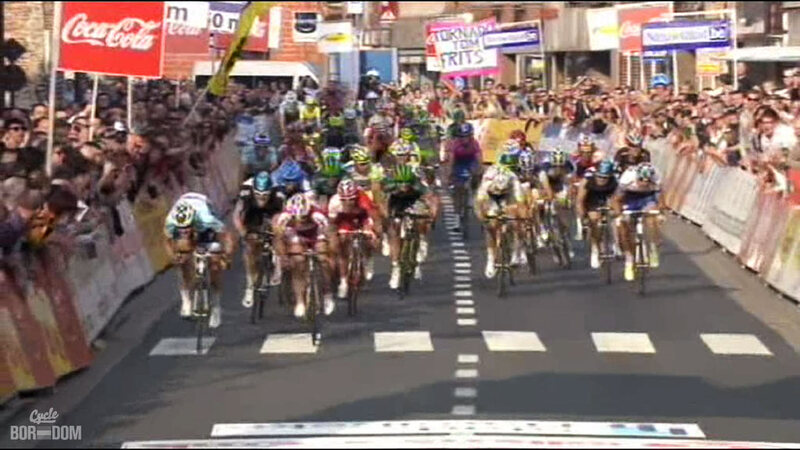 Amazingly, Fabs remounted, chased, caught, and finished with the main bunch. 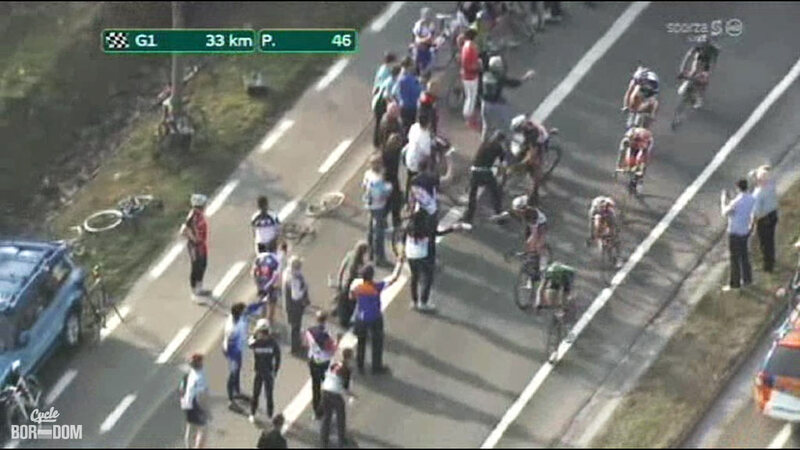 However, he did not contest the sprint. People sprinted. Someone won. 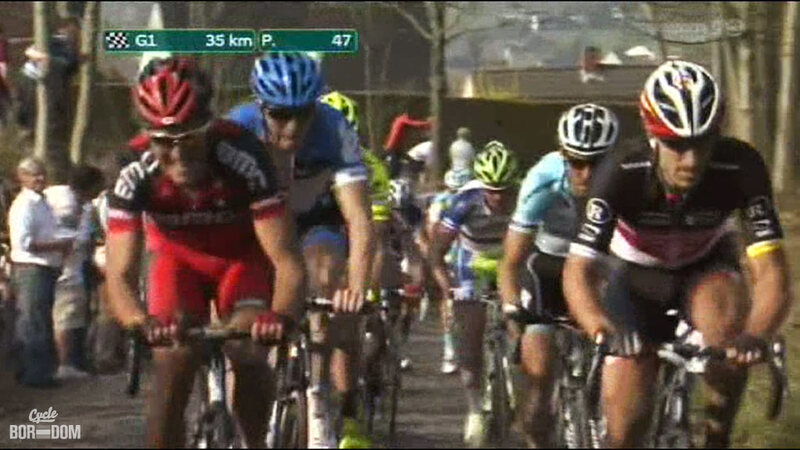 Several attempts were made to break away from the bunch to avoid a sprint, but to no avail. 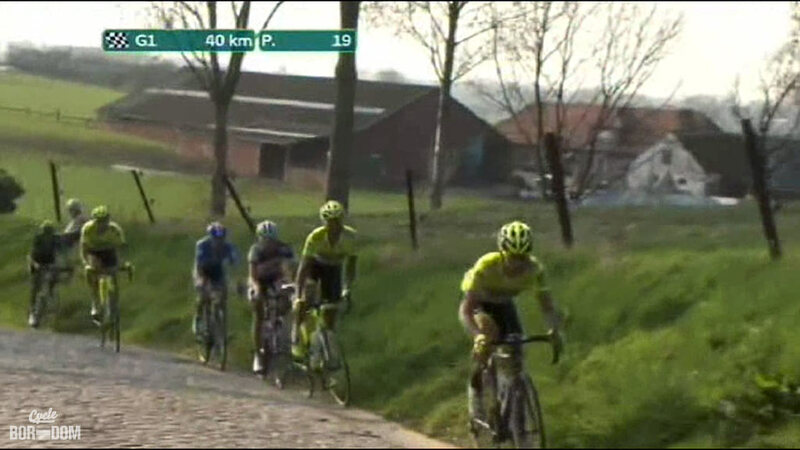 Sep Vanmarcke has the confidence. 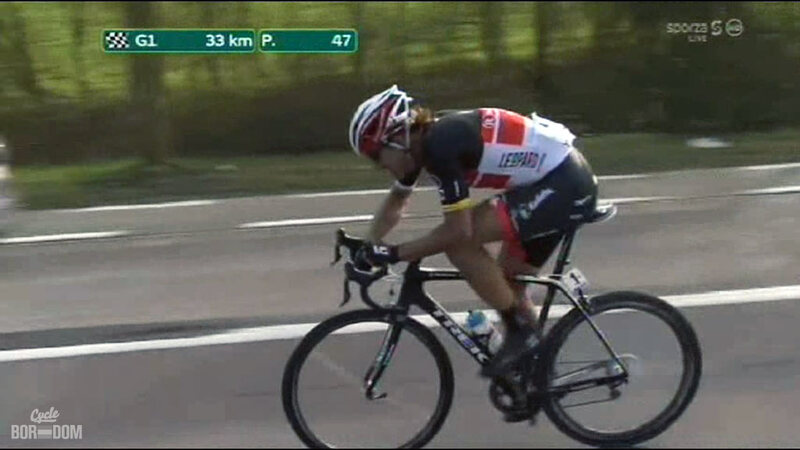 Accelerating on the grass at pelotonal speeds. 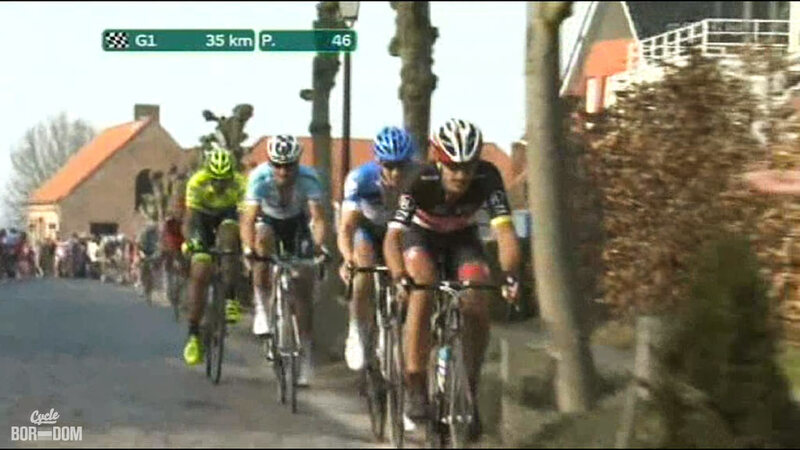 Tommeke sprinting for the win just ahead of a charging Oscar Freire. Notice the sign in the back. 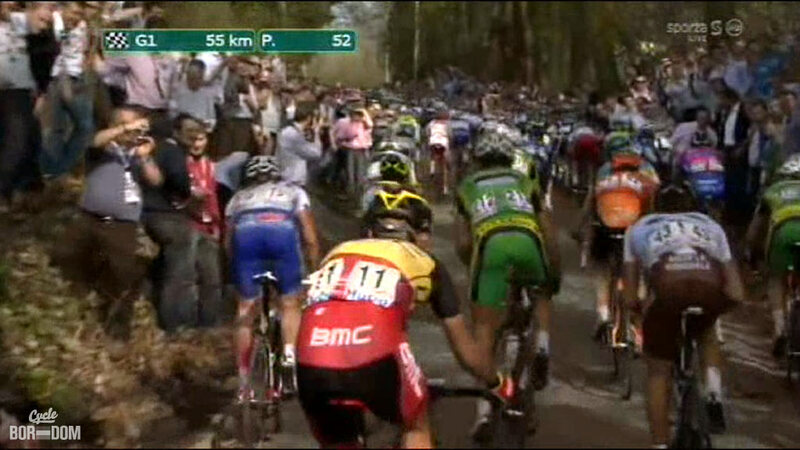 There’s your E3 winnaars: Boonen, Freire, and a surprising Bernie Eisel.